Here I post some quick Torah and Science ideas and questions that I come across. It is well known that the Gemara and Mishnah uses the value of 3 for PI. However we know that PI is 3.1415926... 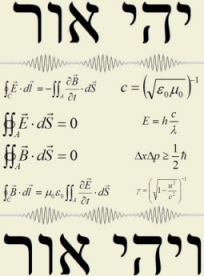 Various answers on this discrepancy have been given, the simplest is that the Gemara/Mishnah are using 3 as an approximation to make it easy for the common man to calculate when halachah dictates a measurement that uses PI. So it seems that the prophet is telling us that PI is 3 as well! One could say that this too is a known approximation, and is not meant to tell one the true value of PI. From an e-mail I was directed to from RationalistJudaism.com, a very interesting gematria comes out of this verse. This gematria is attributed to the Vilna Ga'on (although there is no source to substantiate the claim that the Vilna Ga'on said it. The actual source for the insight may be credited to Matityahu ha'Kohen Munk (Frankfurt-London), who published the thought in the journals "Sinai," Tamuz 1962, and "ha'Darom," 1967). So the ratio of the written/actual word to the practical/read word is extremely close to the ratio of the actual value of PI to the practical/approximation of PI. 333/106 = 3.141509433962265... which is an approximation of PI that is over 99.997% accurate! So from this we see that it is possible that the prophet knew to very good precision the actually number PI but used a value of 3 nevertheless to show that using 3 is a good enough approximation when it comes to halachic measurements. I wrote a little program to generate pairs of numbers that produce ratios close to PI:3. Starting at 1 and continuing, I took note of the best ratios as they appeared. The first pair, is of course 1/1 which gives the ratio of 1:1 which approximates pi=3. The next pair that produces a better result is 12/11 which gives us pi=3.2727. The next is 13/12, followed by 14/13 and so forth- until 22/21 which provides the approximation 3.1428. No better pair appears until 67/64, then 89/85, then 111/106- our value here. Until 1000, there are only two more pairs that give us better results: 244/233 and 355/339. And that's the best you can get for pairs under 10,000. It means that 111:106 is the third best ratio for numbers under 10,000. And it's the best that could be generated from a single letter difference- i.e. a kri/kesiv. In grade school, the picture of the cell we are given is quite simplistic. The real cell is anything but. Here is a really cool animation depicting parts of the cell. Truly a marvel of Hashem! According to Artscroll Yerushalmi Berachos 88b1-2 footnote 11, the Pri Megadim to Magen Avraham says that one may NOT recite the beracha of "maaseh oseh bereshis" on a river unless the river has always been there since the time of Creation. I.e. if there was a large earthquake/volcano/atom bomb that caused a new river to form today, then we would not say the beracha upon seeing such a "new" river. Also, if we purposefully change or add to a river (like a canal), then we cannot say the beracha on the new part of the river. The question arises that if one holds like the authorities (mostly kabbalists) that say that the world is very ancient (on time scales like those that scientists have determined), then it is possible that we could never say this beracha. Since according to geologists, the Earth has gone through huge changes over time, any river we see today is likely not to have existed in the distant past. (For example, during the ice ages, and especially during the gathering of the first water on Earth). It would seem one would have to say that the Creation is not considered truly completed until Adam Harishon was formed. According to that, (and the opinions that the world simply looks old but in reality is only as old as the time of Adam Harishon), we would need to determine if any particular river was around for the last 6000 years before we could say a beracha upon seeing it. It would be interesting to see if it is halachically permissible to use the findings of geologists to make such determinations. It is an interesting gematria that I came across in yeshiva. Basically, if you combine some gematrias of the word techeles, and then convert that number (assuming it is in units of amos (~18 inch)) into nano-meters, you get the maximum absorption frequency of light of indigotin (in the visible range), which is the chemical composition of the dye from the murex trunchulus snail (and the indigo plant). Take a look! When is the Gender of an Unborn Child Determined? One who cries out for that which is past - this is prayer in vain. How so? His wife is pregnant, and he says, "May it be Your will that my wife give birth to a male," - this is a prayer in vain. The academy of Yanni say: The Mishnah was speaking about a woman on the birthing stool. But before that point, one may pray [for the gender] in accordance with "Behold, as clay in the hand of the potter...."
This implies that the gender is not set until right before birth! And further, in Midrash Bereishis Rabba 72:6 we see the opinion of R' Yehudah ben Pazi who says that even on the birthing stool the fetus can be transformed, and thus one can still pray. According to modern science, the gender of the child is determined at conception (although I remember seeing something to the effect that there is a possibility of gender change at the very beginning of pregnancy, but I cannot recall where I read about it). This seems to contradict the gemara's interpretation of the Mishnah in Berachos. However, it does not necessarily. There is a concept in the gemara that one should not count his grain too much, because then G-d will not cause a miracle and give him more. Meaning, that G-d does not want to do open miracles, but hidden ones He does. Therefore, if no one has detected the gender of the child, it would seem that G-d could perform a hidden miracle of changing the gender all the way through pregnancy. (However, today, with ultrasound, it would seem we cut this time down quite a bit - once we detect the gender, a gender change would be an open miracle). This would explain the Gemara's opinion of the Mishnah, that the prayer in vain refers to the time during birth, i.e. where the gender can be observed for the first time. This Midrash is seemingly saying that the gender is decreed at conception! If this is the case, then perhaps (unless this goes against psak halachah) one could take this view and say that indeed gender is determined at conception, and explain the Mishnah above accordingly.